This is Marie Hobbs first exhibition since 1995 and also her first at Galerie Düsseldorf. In this time she has continued to work on several different levels from large canvasses to quite small works, still life and panels of smaller studies. Where her last exhibition focused on memories and recollections, the emphasis in recent paintings implies a more collective, historical dreaming. Inspiration is drawn from the Western Australian landscape, Arnhem Land and the stone coastal pools of New South Wales constructed by convict labour in the nineteenth century. The feelings of significance experienced in these places are explored through a layering of figurative and abstract elements. The tensions within her paintings suggest what cannot be seen - the ghosts and experiences of other times which are tenuously tied to the present by fragments of the past still remaining. Douglas Chambers is one of three Artists to be showcased at ArtFair 2000 in Melbourne later this year and was the subject of a major survey exhibition at the Art Gallery of Western Australia in 1991. Now living in Balingup in WAs South West he remains resolutely committed to a life away from the city. His work touches the earth and captures the breath of both landscape and fauna. 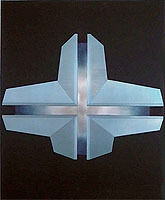 Ernst Ellemunter was the co-winner, along with Andrea Williams, of the inaugural the 1998 Galerie Düsseldorf / Curtin University School of Art, Post Graduate Scholarship. During this exhibition you will be able to buy your organic fruit and vegetables from ErnstsVegievan in the gallery. The viewer becomes the user in this interactive art piece, expanding and questioning the notion of what art is and continually re-defining the boundaries between modes of professional practice. Also to be seen - documentation, drawings, photos, film and other visuals from his organic work. An important exhibition which pays tribute to David Watt - Artist, Lecturer and Friend who died far too young in Queanbeyan, NSW, 7 May 1998. This important exhibition of constructions, sculptures and drawings will allow the viewer to take a Backward Glance at his work. Douglas Sheerers last solo exhibition in 1994 The Coded Image - an abstraction examined the way in which we consider and accept coded images as art. The work in that exhibition was structured around the 'pre-definition' of symbolic representations, rather than the generally accepted manifestation itself. These pre-codes form the building blocks for this exhibition of constructions, works on paper and electronic media - as the digital meets the physical. Following this years residency and exhibition in India, Karl Wiebkes new work offers the viewer vibrant abstractions of flowing colour. Karl Wiebkes work was the subject of a major survey exhibition at the Art Gallery of Western Australia in 1993. Acknowleged as the pre-eminent living Australian artist by Bruce James in Februarys edition of The Art Collector, Howard Taylor is now in his 82nd year. He continues to closely examine the phenomenon of nature, translating and transcending these absolute essences into distilled artworks. Allan Baker born in 1921 in Murwillumba, NSW, has made a significant contribution to the Western Australian artistic community since his arrival in Perth in 1949, both as an artist and as Deputy Director of The Art Gallery of Western Australia and the founding Curator of Pictures and Works of Art at the University of Western Australia. A student of the National Gallery School, Melbourne in the post war years, his early commitment to a socially engaged role for art has formed the core of his artistic life.Su Baker is currently Associate Professor, Head of The School of Art, at the Victorian College of the Arts, the contemporary manifestation of the National Gallery School. Allan Baker's major works include studies of people and places from his travels in the Northwest in WA, Europe and Greece. Su Baker has inherited her father's interest in portraiture as part of her working process. Her portrait of Noel Counihan, friend and mentor of her father was hung in the 1981 Archibald Prize and her entry entitled Self-Portrait at 6 Paces , won the Portia Geach Memorial Prize, in 1997. Over the developing years of her career self-portraiture was a constant theme. While generational influences have changed the forms of representation, inherent in this exhibition are the synergies and visual empathy in the work and life of father and daughter. .
Born in Meckering in 1926 Brian McKay formed the Perth Group in 1976 with Guy Grey Smith, Robert Juniper and Tom Gibbons. He later joined the Praxis group in 1976. 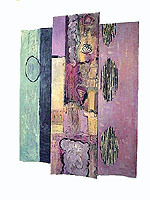 A major survey of his work was held at the Art Gallery of WA in 1982. Having spent many of the past few years engaged in major public art commissions such as the Central Park foyer and the new sculpture in East Perth, his first solo exhibition for many years is eagerley awaited. Alex Sprembergs major survey exhibition Works from 1976 - 1994 at The Lawrence Wilson Gallery in 1994 documented well his long lasting engagement with paint, surface and support. In this new group of paintings he explores luscious transluscent mediums. All material correct at the time of publishing 16 February 2000. Exhibition details are always subject to change.